On the 14th of December 2010 ParaToys/ BlackHawk introduced the first production, made for Aviation! Four Stroke motor for PPG. The Hell Cat 360 was named after the Gruman Hell Cat airplane that battled the Japanese Zero in the Pacific during World War II. The Hell Cat was known for its immense power, agility and extreme durability. The BlackHawk Hell Cat has proven itself worthy of it's name! All our testing has proven this motor to be what we expected; a powerful, extremely durable and quiet engine with excellent fuel concumption. The Hell Cat 360 (360cc) is an amazing engine with twin cylinders, four valve heads, water and oil cooling AND only weighs 69.5 pounds including the radiator , complete re drive assembly , exhaust and 24 volt Ni Cad battery! That is 70 lbs less than a complete Generator based engine. Power? 35 honest HP at 7,800 rpm makes this motor the most powerful in PPG, Thrust tests thus far has put it well into the 200lb range. A 2 Blade Power Fin Prop is Standard and a 3 Blade Power Fin is the only option in this amaing package. Each and every item that makes up a BlackHawk Powered Paraglider is fully Warranted 100% for two years to the original purchaser from the date of original purchase of any factory defects (engine carries a manufacture 6 month warrenty). The following items are included in this warranty: cage, couplers, rods, frame, gas tank, harness, carabineers, throttle, motor mounts and motor mount plates. This warranty excludes any and all items that are damaged by the Pilot in launching, landing, flying or transporting or misuse of said BlackHawk Powered Paraglider. The BlackHawk R80, R120, Talon 175, MZ313, Rocket 313 and Hellcat 313 engines carry a 6 month Manufacturers warranty against factory defects from the original date of purchase. All engines are subject to the manufactures warranty and conditions Warranties are not transferable to anyone other than the original purchaser. Please contact BlackHawk for Manufacturers warranty conditions or claims. Not included under our warranty are any type of engine seizures caused by improper carburetor tuning, adjustment or failure to properly follow the manufacturers maintenance instructions. 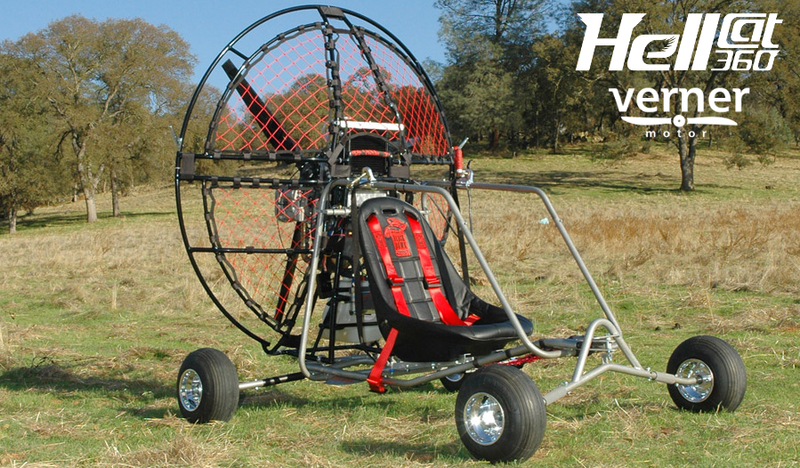 Click the button below to add the Blackhawk HellCat 360 Paramotor to your wish list.